With over 3 miles of paved bike trails leading to exciting attractions in Lake George and Glens Falls, biking in the Adirondacks has never been better! Peddle fast or enjoy a leisurely ride – whichever speed you choose, we guarantee you will enjoy your ride. Our lodging in Lake George offers bike trails that beckon all riders, from the experienced to the novice. Enjoy this great outdoor activity with your family and friends. Along with biking, hiking and fishing are other favorite pastimes for families staying at our lodging rentals. With so much to choose from, your days will be nothing but fun! Perfect for families with young children, the paved bike trails within our private lodging in Lake George invigorates even the youngest bike rider. Make your stay at our vacation rentals in Lake George extra special by venturing out on our paved bike paths throughout the park. The Buddy System – Even though the park is securely enclosed, it is a good idea to make sure children have a buddy to accompany them on their bike ride. Not only is biking in a group double the fun than riding alone, but it ensures added safety while on the paved bike trails. Make sure you educate your children about the Park’s boundaries, possibly accompanying your older children first before they go on the trails with their friends. The Buddy System applies to all activities – whether you are swimming in the pool, hiking up French Mountain or enjoying a wonderful horseback ride. Bike riding in the Adirondacks will instill wonderful memories that you will cherish with your children for years to come. Wear a Helmet – This is essential when bike riding in New York State. Whether you are riding on the paths within our Wilderness Lodging in Lake George, or other Adirondack bike trails, it is important to remember this necessity. Equip your children with bike helmets and other riding apparel and enjoy your ride through the Park. Bring the Necessary Equipment – Before you venture out on the bike trails, make sure to check the local weather forecast – you don’t want to get stuck out in the woods when a rain shower or thunderstorm is on its way. Be prepared with extra clothing; rain coats, sweatshirts, and sunglasses. Also, don’t forget to bring along an extra First-Aid kit, map, compass and sun block for those sunny days. Bumps, scrapes and bruises happen frequently with the little ones, therefore it’s better to be prepared for every situation. For those hot summer days, you may find shade under a tall pine tree, but you cannot escape humidity. Bring along a water bottle or thermos to share with your group. Respect the Hikers – Along with bike riding, family hiking in the Adirondacks is another favorite pastime shared by adventurers and tourists alike. While on your bike ride, make sure to pay attention to your surroundings. Not only will staying alert help in avoiding getting lost, it will also make you aware of other patrons that may cross your path. Since the paved trails are used by so many of our guests (hikers, walkers, and joggers), make sure to be respectful to all of our guests. Teach your children that abiding by the rules with not only keep them safe, but guarantee a fun-filled, action packed bike riding experience. Although we would love for you to enjoy the paved bike trails within our Lake George vacation rental property, if you decide you’d like to venture out of the park, here are some additional trails that are both popular among biking enthusiasts and ideal for families. This scenic, 8-10 foot wide, well-maintained dirt road is ideal for a family biking adventure. 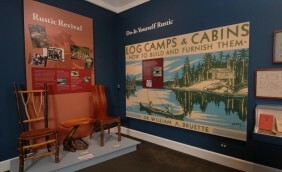 Discover clear views of the High Peaks as well as educate your children about the history of the Adirondacks. Elevation: 340 Ft. Flat and gently rolling hills. Enjoy this beautiful 40 mile stretch of rugged dirt roads and 27 miles of single track and double marked trails. Teach your children the importance of marked trails along paths – whether you plan on hiking or biking in the Adirondacks, it is imperative to follow the marked trails and stay with the group. Directions: exit 31 off of I-90 onto Route 12/28N. Go North for about 25 miles and make a right onto Route 28. Travel about 39 miles (past Old Forge) to Inlet. Eastern gate access to Moose River: Go just past Inlet, you will see the signs to Limekiln Road – access is 2 miles from Route 28. Western gate access to Moose River: Take Cedar River Flow Road, off of Route 28. You will see a ranger station 12 miles in. 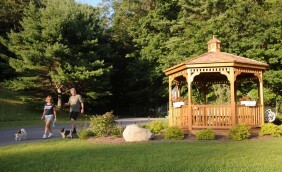 Enjoy a bike ride on the paved trails within our Wilderness Lodging in Lake George with your family and friends. 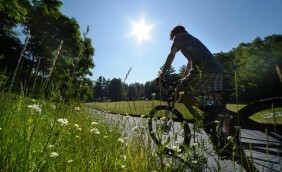 Explore the great outdoors while biking in the Adirondacks! Our outstanding Lake George lodging provides the very best in accommodations and amenities for your vacation. Rentals in Lake George Wilderness Lodging are a great alternative to the standard fare! What vacation would be complete without a horseback ride? For many of us, trail riding when we were younger was a special treat, and became something to be remembered forever. Now your Lake George vacation can include a scenic horseback ride through the forested hills and mountains that surround the Queen of American Lakes. 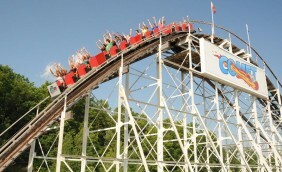 There are trails and rides for all levels of participation. Even if you’ve never been on horseback before, your trained guides are committed to your safety and enjoyment. They will make sure that the ride you are taking and the horse you are riding are appropriate to your level of ability and comfort. One of the most rewarding parts of a trail riding on horseback is realizing how experienced and agile the animals are. As you make your way through the lush wooded Adirondack trails and over stream beds, the rhythm of horse and rider is relaxing, comforting and reassuring. Horses are instinctual animals, and are keenly attuned to your mood and emotions. They are trained to respond to the needs of the rider and will do their best to make sure your ride is easy, fun, and memorable. You will experience the woods and the beauty of nature in a way that is totally unique. This is a particularly memorable experience for the little ones. Children love the horses, and the feeling is mutual! 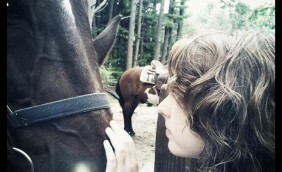 Sharing the beauty of nature with them on horseback will provide them with cherished memories for many years to come. Most trail rides last approximately one hour, giving you plenty of time to bond with your horse, enjoy some fresh air and get some exercise. Just a note: Horseback riding requires a surprising amount of exercise – you will probably become acquainted with muscles you didn’t know you had! Just a short drive from your private vacation rentals in Lake George are several stables that provide hourly – or longer- rentals for trail rides. If you have a very large party or would like to take a lengthy ride, it might be a good idea to call ahead! Take time to explore the incredible Lake George views and the Adirondack Mountains on horseback. It is truly an experience of a lifetime and a pleasurable activity that will become a long-remembered Lake George vacation favorite! 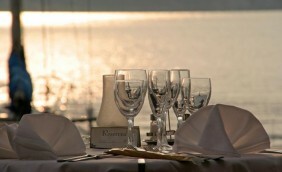 Discover for yourself why generations of families return to our luxurious,Vacation Destination Resort year after year! Experience what hotels in Lake George cannot provide – a comfortable, private Wilderness Lodging vacation experience! Where will you find the best Lake George hotels, motels, or vacation rentals? Treat yourself to the most unique and comfortable lodging in Lake Georgeand experience a vacation like none other. Some of the best family memories are made on vacations, and when it comes to making memories, fishing is right on the top of the list! How long has it been since you sat on the shore with a box of fresh worms and a peanut butter sandwich, or trolled the open water in a fish-finding motorboat? Remember how you would hear the fish jump, but the only sign of them you ever saw was the little circle of ripples where they popped out of the water? Our tastefully appointed, comfortable and private Lake George vacation rentals have onsite amenities that include a stocked fishing pond for the enjoyment of even the youngest budding sportsman! You can share those precious memories and create new ones while enjoying your stay here in beautiful Lake George. From bass fishing and adventurous bike trails to enjoying live concerts on stage…Wilderness Lodging has everything to make your vacation unforgettable! 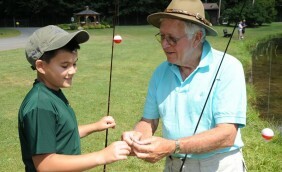 Don’t forget that a valid license is required for fishing in New York State! Check here for Fishing License Information from the NYS Department of Environmental Conservation before heading out to catch the big one. Life preservers are a must when fishing from a boat, but they’re a good idea for children even on shore! Necessary for boating on Lake George, life preservers are extremely important to have at all times. Dress for the occasion! Outdoor shoes are a must for navigating slippery rocks and staying stable in a boat that’s wet. Bring along a hat and some work gloves just in case. If you get caught out in a rain shower, make sure that you have an appropriate rain jacket. Rainy days may creep up on you – so always be prepared! Be mindful of getting your line tangled…too many times even the most experienced fisherman has fallen into the water trying to retrieve a snagged fishing line! Sunshine is one of the best parts of fishing, so bring along lots ofsunscreen, water for drinking, and snacks. While boating on Lake George, the sun’s rays may become overbearing. Be mindful of the sun and apply sunscreen after every swim. Be courteous to others: Don’t throw a line in the water near swimming areas. Don’t litter! Keep our beautiful waters pristine and clear for the next generation. Everyone from the youngest to the oldest can get in on the act! There is nothing better than to see the expression on the face of a small child who has just had his or her first run-in with a feisty Perch or Punkinseed! Pan fishing is a huge summer sport for kids, and provides them with exciting vacation memories that will last a lifetime. When you return at the end of the day, your incredible Lake George lodging unit awaits – with swimming, tennis, Bingo, even a movie. We have long been providing families with treasured vacation memories. Our accommodations are spacious, luxurious and private units, geared toward your comfort and enjoyment during your stay. 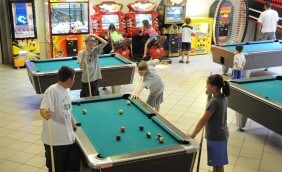 Be sure to check out our exciting vacation rental amenities and other Fun Stuff you can enjoy during your stay! With all the available family entertainment in Lake George NY, you can plan an exceptional vacation this year! Our luxury resort offers RV site rentals, along with luxury park model rentals geared to your family fun needs, with premier accommodations and your own spacious suite. Lodging in Lake George has never offered so many options or been so much fun, with a variety of activities for all members of the family right here in our award-winning family vacation resort! From invigorating hiking and biking trails, to horseback riding and fascinating museums retelling the history of the Adirondacks – there are an abundance of activities within a short drive from our lodging in Lake George. There is so much to do and see in this beautiful area within just a short day trip from our location – allow us to help you plan your unforgettable Adirondack vacation. Call us today at (518) 792-3775 to check rates and availability, make a reservation, or to learn more about our vacation rentals! Are you in need of a family getaway and looking for private, comfortable and affordable Lake George lodging? Interested in finding a resort that has bothfun-filled activities for children of all ages, along with a vast array of five star amenities? Our Lake George vacation rentals not only accommodate a family of six, but also include spacious living rooms, bunk beds for small children, central air conditioning and wireless internet. No need to search for Lake George house rentals – bring the comforts of your home to our private vacation rentals that offer more privacy than most hotels in Lake George, and relax at our extraordinary family resort. We guarantee your children will love participating in our numerous fun-filled, family oriented activities. Whether you are looking for rainy day activities, horseback riding opportunities, fishing or fascinating museums, our Lake George vacation rentals offer entertainment for your entire group. Make your stay at our unique Lake George vacation rentals unforgettable! With over 3 miles of paved bike trails, 4 playgrounds, movie theaters, horseshoe pits and swimming pools on premises, our premier Lake George lodging facilities are second to none. Reserve a private unit for your unforgettable stay! Here are some ideas for fun-filled vacation activities and family entertainment in Lake George. Our lodging in Lake George is second to none – experience why our spacious vacation rentals are your home-away-from-home. 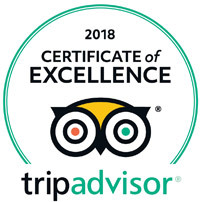 Experience the excitement of staying at our unique vacation rentals. Make it a family vacation of a lifetime, with many memories and fun times to cherish.We look forward to welcoming you to our Lake George vacation rentals. A summer vacation at our rv resort wouldn’t be complete without a Lake George boating experience. Enjoy a boat ride along the crystal clear waters of Lake George….climb on board a pontoon boat with family and friends and take a leisurely sail out to the various islands dispersed throughout the beautiful Lake. Do you have the need for speed? 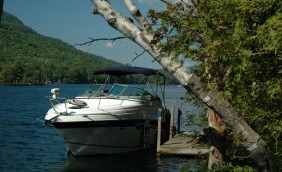 Rent a speed boat from one of the Lake George marinas located throughout various points around the Lake. Whichever way you prefer to sail, there is a boat ready for you – just make sure to anchor your boat and take a swim! Planning a family getaway this summer to Lake George? 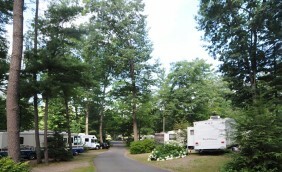 Our RV vacation rentals are a perfect option for your family! Not only are you close to exciting family entertainment, bike trails and Lake George museums – but you are also close to the Million Dollar Beach and numerous boat docking areas. Sunbathe on the Million Dollar Beach amidst the beauty of the Adirondack Mountain landscape, create sand castles with the youngsters or sign up for a beach volleyball tournament with a group of your friends. The sun is warm, the water is sparkling and the atmosphere of Lake George is unbelievable! Don’t own your own boat? No problem! No matter where you are in Lake George, marinas have what you are looking for. From fishing boats, canoes and kayaks, to Sea Doo jet skis and Bowriders, you can rent a clean, safe and fun family boat to make your Lake George vacation complete! From Lake George Village in the southern basin to Ticonderoga in the northern basin – locate a marina and find the boat of your dreams today. While on vacation, don’t worry about finding an area to store your Lake vessel – allow the professionals at your marina of choice to take care of it for you. Lake George marinas provide fuel, boat storage, repairs, dock rentals and launching equipment to make your experience the best! See the beauty of Lake George and the surrounding Adirondack Mountains by water – rent a boat while staying at the vacation rentals in Lake George. 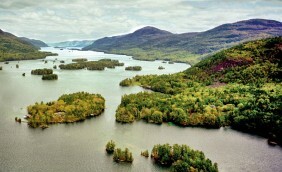 Be Courteous: Lake George is a popular destination for swimmers and boaters alike. Due to the large volume of boaters every year, it is essential to be alert and courteous of other boaters, swimmers and those fishing. Keep it Clean: This Lake is your Lake! Make sure to clean your boat before embarking and after you launch. Don’t litter, and keep the water clean for others to experience the beauty. Calling All Speed Demons! Reduce your speed when approaching the Village of Lake George. Always be aware of those around you and check back to see if anyone has crossed the path of your wake. Leave the drinks behind: Drinking while boating is illegal. Obey the law for safe, fun and healthy boating. Watch the Skies: Due to the fact that Lake George is 32 miles long and 3 miles wide, an onset of harsh weather can happen quickly. Be prepared at all times for rainy weather. It’s Deep! While boating, pay attention to sudden drops in Lake depth. At certain points, you may reach sandy bottoms, then cast over depths of almost 200 feet. Learn the Lake George navigation rules prior to venturing out on the Lake. Enjoy your cruise and know where the shallow, sandy parts reside. Have Fun! After all, you are on one of the most beautiful Lakes in the region – Lake George is a family oriented, fun-filled, year round vacation destination. While staying at the vacation rentals in Lake George, Take your children on a beautiful boat ride to remember along the pristine waters. Here is some information regarding boating on Lake George and activities located near the Wilderness Lodging vacation rentals. Come visit Lake George on your next vacation and see the difference! Plan Your Visit to Lake George! 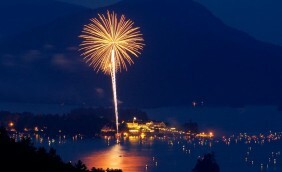 There is always something to do in the Village of Lake George. Vacation rentals boast fun and excitement, especially during peak vacationing months.Book an exciting vacation to Lake George today and discover for yourself why generations of families return to our luxurious, Vacation Destination Resort year after year! Call us today at (518) 792-3775 to check rates and availability, or request more information! Ready to discover Lake George NY? If you are enjoying your Adirondack camping experience at Lake George RV Park, you may like to get out and about in scenic Lake George NY. 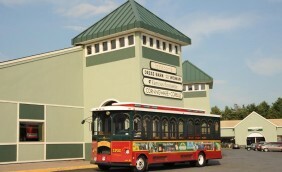 Well, our super-close proximity to Lake George – a quick and free trolley ride during the summer, makes all of the attractions, events, shopping, and dining in this vacation destination easy to experience! Every family member will enjoy swimming at one of the several public beaches with breathtaking views of the Adirondack Mountains. Attractions in Lake George include family-friendly cruises around Lake George, along with evening jazz and dinner cruises for adults looking for a night out on the town! Enjoy the great outdoors, hiking the Adirondack Mountains and enjoy an experience like no other. With amazing views of Lake George from some of the summits, the High Peaks region of upstate NY is worth discovering! There are easy hikes for children and families, or you can challenge yourself on some of the more difficult trails. 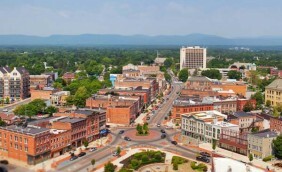 Our region is rich in history and the arts. Enjoy many area museums, from the world-class Hyde Museum in nearby Glens Falls, to the popular House of Frankenstein Wax Museum in Lake George…not for the faint of heart! Nearby scenic horseback rides through forests and hills surrounding the lake are available – ask us for recommendations! What vacation at the lake would be complete without some sort of amusement or waterpark? Six Flags Great Escape & Splashwater Kingdom offers a full day of rides and games, while Water Slide World Lake George affords cool and refreshing family fun! Lake George shopping includes several outlet malls offering name brand clothing and products, and nearby Queensbury NY has more of the well-known supercenters. After a perfect Lake George, Adirondack day, enjoy the many diverse area restaurants that are sure to please every palate….discover some of the most decadent and beautiful lakeside dining as you watch the magnificent lights of steamboats pass by. When you are ready to discover Lake George NY from the comfort of our luxury resort, call us today at (518) 792-3775 or contact Lake George RV Resort online to check rates and availability, make a reservation, or request more information on our conveniently located Lake George NY campground.